On Thursday President Trump signed legislation imposing new sanctions on Hezbollah. 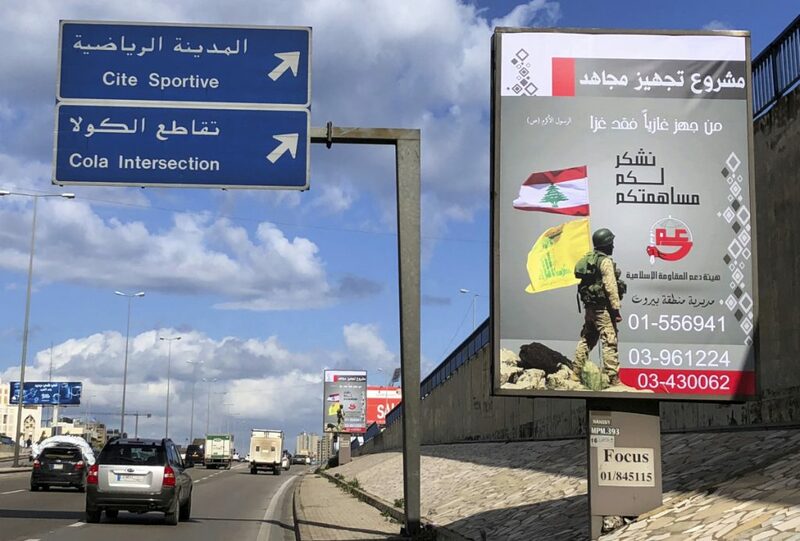 BEIRUT – Giant posters on the streets of Beirut’s southern Shiite suburbs display an armed Hezbollah fighter in uniform, holding the group’s yellow banner and Lebanon’s national flag, along with phone numbers where supporters can make donations to the Shiite guerrilla force. “He who equips a warrior is part of the battle,” the posters declare, quoting a saying from Islam’s Prophet Muhammad. Hezbollah’s calls for donations have intensified in past months as the group and its main backer Iran come under increasing financial pressure under sanctions from the Trump administration. Washington has imposed sanctions on the militant group for decades. But a new wave this year appears to be more serious about targeting Hezbollah’s top leadership as well as businessmen and companies that Washington says are funding the group. On Thursday, President Donald Trump signed legislation imposing new sanctions against Hezbollah at a White House event marking the 35th anniversary of the Beirut barracks bombing that killed 241 Marines. The bill expands the list of those who can be sanctioned for doing business with Hezbollah. On Oct. 15, when U.S. Attorney General Jeff Sessions designated Hezbollah as one of five groups considered top transnational organized crime threats. Iran, facing its own financial crises, has also reportedly cut back on funding for Hezbollah and Shiite militias it supports in Iraq. Iran touts itself as the leader of the so-called “Axis of Resistance,” grouping the Syrian government of President Bashar Assad, Shiite militias in Iraq, Hezbollah in Lebanon and Shiite gunmen in Yemen known as the Houthis. The U.S. State Department said in July that Iran has spent over $16 billion since 2012 supporting Assad and its proxies in Iraq and in Yemen, and it also gives $700 million a year to Hezbollah. It has also given the Syrian government $4 billion in lines of credit, it says. Hezbollah’s budget has already been hurt ever since it became heavily involved in Syria’s civil war in 2013, sending fighters to back Assad’s forces and helping turn the conflict in his favor. An estimated 2,000 of its fighters have been killed and thousands more wounded, some with permanent disabilities. That only adds to the costs, since the group pays stipends to families of “martyrs” and provides health care for fighters. Recently, its leadership started to publicly acknowledge the strain. “I won’t say that the sanctions will not have an effect … They will have an effect for sure,” Hezbollah leader Sayyed Hassan Nasrallah said in a speech in August. He vowed the sanctions won’t diminish the group’s power. “We have the strength, infrastructure and human resources to get through these difficulties, God willing,” he said. In a closed meeting around the same time, he told Hezbollah cadres, “We have to tighten belts a bit,” according to Ibrahim Bayram, an expert on Shiite affairs who writes about Hezbollah for Lebanon’s An-Nahar newspaper and was informed about the meeting. The group is taking measures to reduce expenses, such as bringing down the number of fighters in Syria, especially now that Assad’s military has taken back greater territory from his opponents, Bayram told The Associated Press. But he said it was not cutting back on stipends for families, medical care and retirement payments. A Lebanese citizen who has relatives in the group said it has pulled back some fighters in Syria, though it maintains its presence in eastern Deir el-Zour province and in the south, where fighting continues with the Islamic State group, and in Quseir, a town near the border with Lebanon that has been a Hezbollah stronghold for five years. It has also asked some full-time fighters to spend more time at home when there is no need for them and has reduced movements of vehicles to cut transportation costs, he said. He spoke on condition of anonymity to discuss the group’s internal activities. Despite the tightening, the group hardly seems to be diminished from its status as the strongest fighting force in Lebanon – and one of the strongest in Syria – boasting an arsenal of rockets and a powerful political structure. Even if other funding streams are under strain, Hezbollah can still count on public contributions, which stream in through tens of thousands of metal donation boxes placed in shops, streets, mosques and schools in predominantly Shiite areas of Lebanon. Its patron Iran, meanwhile, is facing deep economic woes. Trump withdrew the United States from the nuclear accord with Iran, although the United Nations has repeatedly acknowledged Tehran was living up to the terms of the deal. Trump said he wanted stricter terms to limit Iran’s ballistic missile program, curtail its regional influence and forever limit its nuclear activities. Crushing U.S. oil sanctions on Iran will resume in early November and already, American allies in Asia are cutting back on their purchases of Iranian crude. While European nations say they want the deal to continue, U.S. clout in global financial markets led oil companies and airplane manufacturers to withdraw from working in Iran. Iran’s currency, the rial, has plummeted in value, and the downturn has sparked protests. Another ally of Iran, the Yemeni rebels known as the Houthis, are also preparing for difficult times, especially as their opponents, a Saudi-led coalition, besieges the port of Hodeida, a major source of income for the group. The rebels have sharply increased taxes on merchants and businesses. Iranian-backed militias in Iraq are buffered to an extent from any financial crunch because they also get funding from the Baghdad government, which is nominally a U.S. ally. The militias are part of the government-sanctioned paramilitary group known as the Popular Mobilization Forces, with some 100,000 fighters, who get salaries and equipment from the state. Many of the militias also profit from businesses they run on the side. An official with Iraq’s Kataib Hezbollah, one of the main groups backed by Tehran, even said his group could help Hezbollah financially if need be. He spoke on condition of anonymity to discuss the internal workings. “We can last this way for three years,” he said.